What is the best way to achieve an effective key with green or blue screen? If you have ever used the built-in filters in Final Cut Pro, you know these are not the answer. Even with 10-bit uncompressed footage, the keys with the native chroma key filter look horrible. I recently saw a demonstration of a new product called Conduit by DV Garage, the same company that created DV Matte Blast and DV Matte Pro . 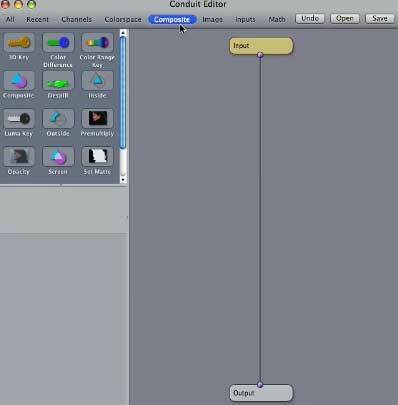 Conduit is a nodal-based compositor. 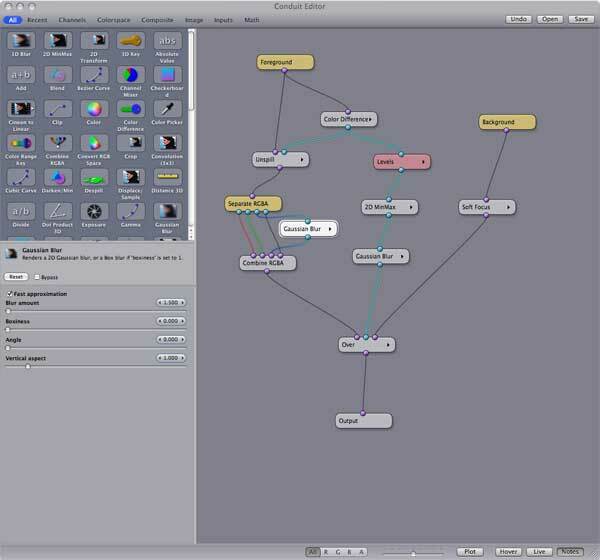 Instead of working with layers in programs like Final Cut, Motion and After Effects, it uses a flow-chart design similar to programs like Shake and Nuke. Conduit uses FxPlug architecture to utilize the GPU or graphics card to provide fast, and in most cases, real-time performance. It works inside of Final Cut Pro 5.1.2 and Motion 2 or higher. In both programs Conduit is applied to a clip as a filter. Once you apply it and click on the filters tab, the interface tab has several sections. On the bottom are a series of sliders that can be used to animate any of your settings in Conduit. 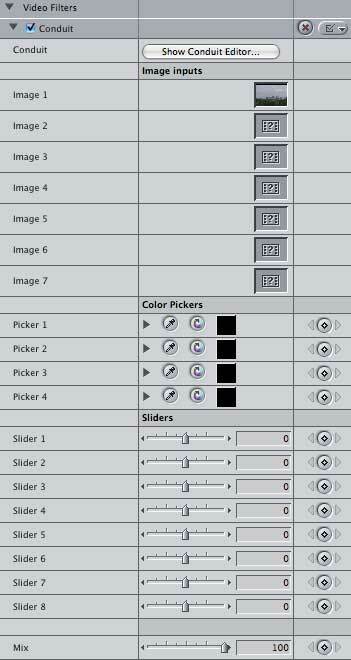 Above the sliders there are color pickers that you can use to bring in colors from FCP or Motion. Above that are image wells into which you can drag video to use inside the Conduit interface. At the top is a button that launches Conduit. When the Conduit editor opens, the interface reveals 3 windows. 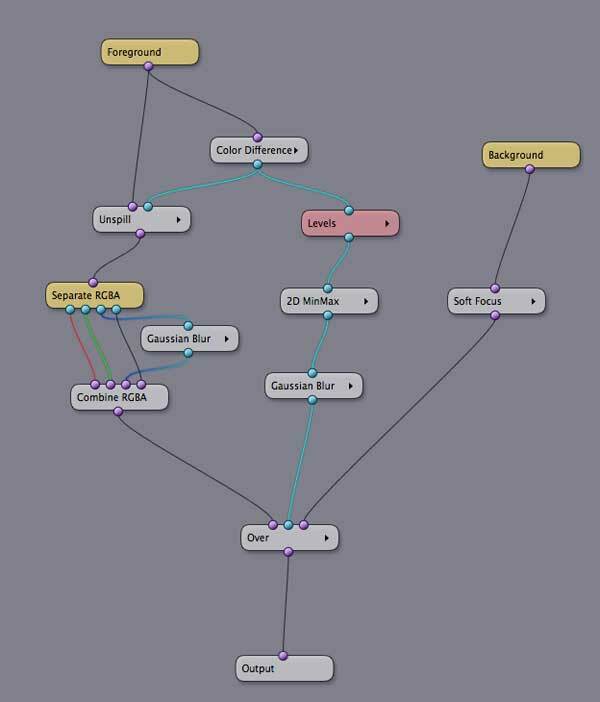 The upper-left section contains the nodes that you use to build your effects. Across the top of window there are buttons to select the various categories of nodes to view. 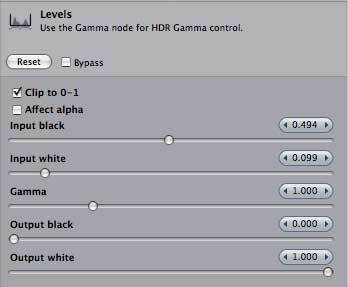 When you select a node in your project, its parameters appear in the lower-left window. The large window on the right is where you build your composite. When you start a new project this window contains an input node and an output node. 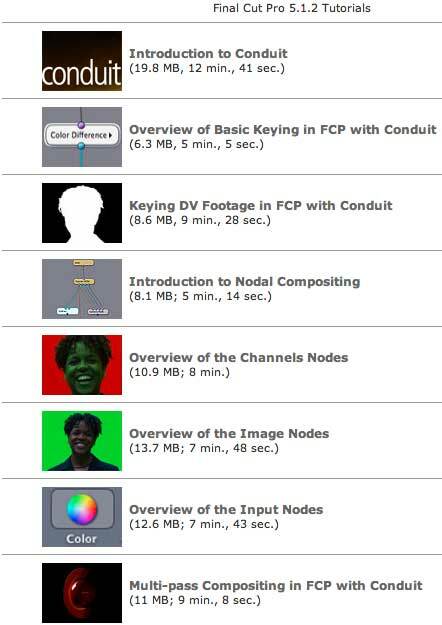 Node-based compositing can be a very daunting task. Fortunately, Alex Lindsay and the folks at DV Garage have put together over 2 hours of high-quality QuickTime movies to help us out. 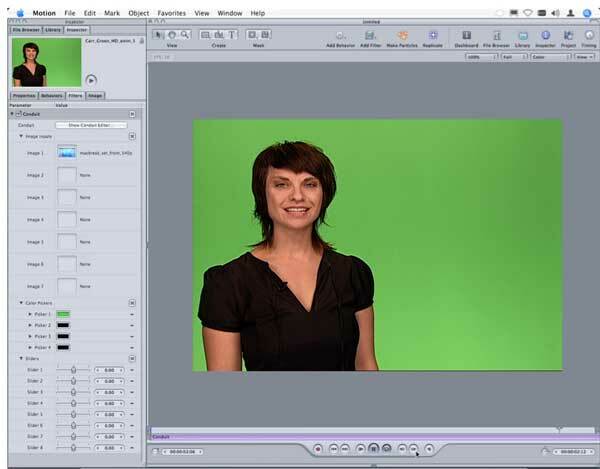 There are tutorials for Motion and FCP that introduce us to the interface as well as the concept of nodal compositing. 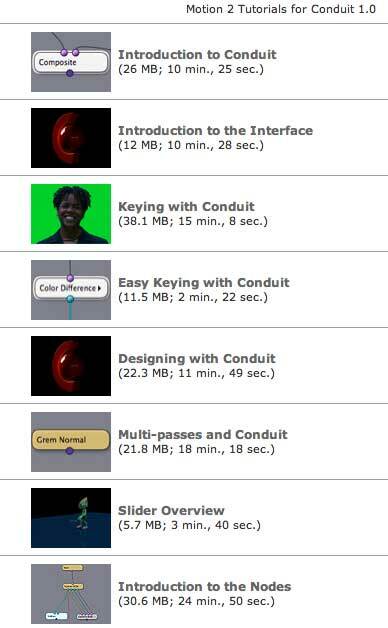 After watching these tutorials, I felt comfortable enough to dig into Conduit and build a keyer from scratch. Using the program in both Motion and Final Cut Pro is basically the same. You apply the Conduit filter to a clip and click on the button to launch the interface. As I said earlier, there are image wells, sliders and color pickers that you can also utilize in the filter tab, but they aren't necessary to use Conduit. 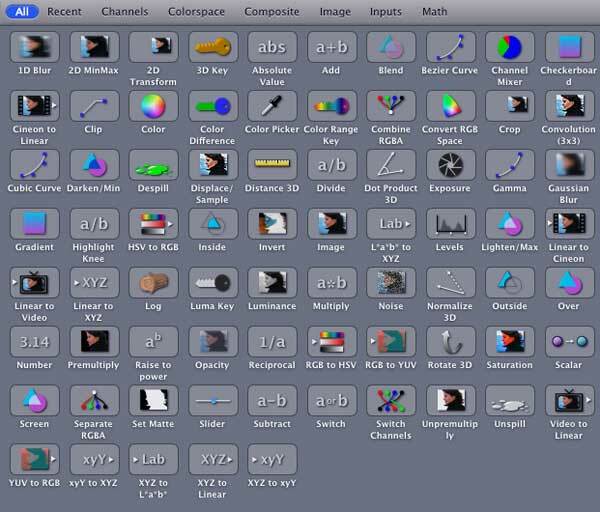 You may prefer to leave your backgrounds as a separate layer in Motion 3 to take advantage of its 3D environment. While we purchased Conduit with one purpose in mind, it is much more than just a keying solution. Rather than turning this review into a full-blown tutorial, I recommend taking a look at their web site and exploring one of the QuickTime tutorials to see just what Conduit can do. They offer a free trial download, and every purchase comes with a 3-month subscription to The Pixel Corps where they will be handling tech support. For $150, Conduit is a steal! I highly recommend it. Michael Stathopoulos is an Apple-certified trainer for Final Cut Pro and an editor for Universal Music Group's 24-hour global music channel, IMF The International Music Feed, which can be seen on DISH network.